ST. PETERSBURG, Fla. (AP) — A couple of solo home runs from unlikely sources and four strong innings of relief were just enough for the Tampa Bay Rays to get their first and only win of the season over the Kansas City Royals. Brandon Guyer and Kevin Kiermaier homered, and four Tampa Bay pitchers held the Royals to one hit over the final five innings Sunday in the Rays’ 3-2 win. By salvaging the final game of a three-game series, the Rays prevented the Royals from a 7-0 sweep of their season series, a feat they have not accomplished since going 12-0 against Baltimore in 1988. The AL Central-leading Royals lost for only the sixth time in 23 games. "They’re kind of firing on all cylinders right now and we need to get to that point," Rays manager Kevin Cash said. "We needed this win because we’ve had some frustrating losses, no doubt. We needed to bounce back and get a win in a tight ball game." Kiermaier’s sixth-inning homer off Luke Hochevar (1-1) broke a 2-2 tie. 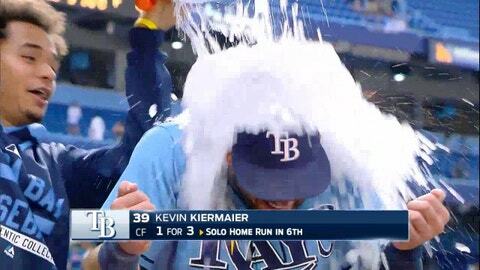 It was Kiermaier’s second homer in two games and sixth of the season. Xavier Cedeno (3-1) got the win in relief while Brad Boxberger pitched the ninth for his 32nd save. Four of Kansas City’s seven hits came during a two-run third that included RBIs by Ben Zobrist and Lorenzo Cain. The Royals had a chance to tie it in the eighth when Rays first baseman James Loney turned a double play by throwing Zobrist out at the plate after fielding a bouncer the Royals thought was foul. "A game shouldn’t be decided on a play like that," said Kendrys Morales, who never left the batting circle and was tagged by Rays catcher Rene Rivera. "It’s a little bit frustrating. That play should be reviewable." "I think we had some luck on our side right there," Kiermaier said. "But for us to close out a game today was great because we’ve struggled doing that lately." Rays starter Nathan Karns gave up two runs on six hits while striking out five. It was the rookie right-hander’s 19th start in which he has given up two runs or fewer, most in the AL. Kansas City starter Danny Duffy gave up two runs while striking out six in five innings. Guyer led off the third with a homer on an 0-2 pitch from Duffy, his sixth of the season. "A lot of my homers this year have come with two strikes," said Guyer, who had three hits and scored twice. "I choke up on the bat and just stay simple, put it in play. That’s when a lot of the power comes, but on that one I wasn’t thinking home run at all." Kiermaier’s home run off Hochevar accounted for the only run given up by the Royals’ bullpen in the series. … The Rays’ bullpen has given up only one run over 17 2-3 innings in the last four games. … Boxberger took the AL lead with his 32nd save. Royals: OF Alex Rios, out of the lineup for the second straight game with a virus, was sent back to Kansas City. … RHP Ryan Madson has been resting since Aug. 22 to recover from a dead-arm period. Rays: OF Steven Souza Jr. (broken left hand) is hitting off a tee and doing soft toss. He expects to be back in mid-September. Royals: RHP Johnny Cueto (9-9) looks to end a personal two-game skid when he faces Detroit RHP Justin Verlander (2-6) in the opener of a nine-game homestand Tuesday night. Verlander is coming off a 5-0 shutout Wednesday against the Los Angeles Angels in which he took a no-hitter into the ninth inning. Rays: RHP Chris Archer (11-10) will go against Orioles LHP Wei-Yin Chin (8-6) Monday night to start a three-game series in Baltimore.